The name, Megaptera novaeangliae, is derived from Greek words megas for large pteron for wing the Latin word novus for new and the Middle English angliae for England. 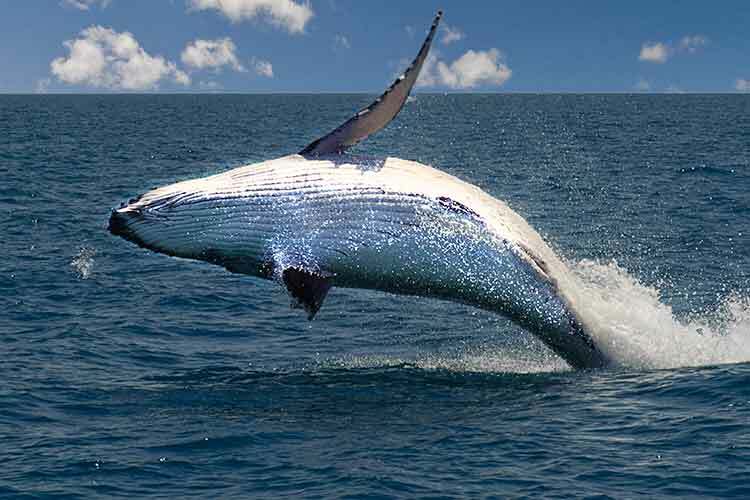 Humpback whales belong to the group of mammals called Cetacea. This group includes all of the dolphins, whales and porpoises. 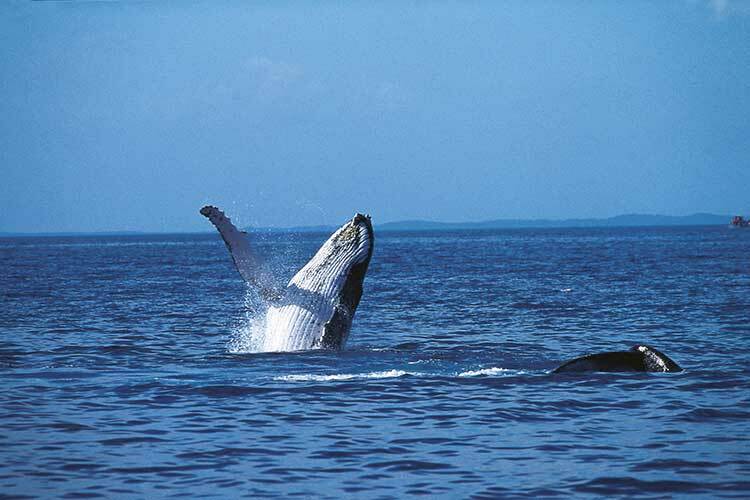 There are two populations of humpback whales in the world, one living in the southern hemisphere and the other in the northern hemisphere. 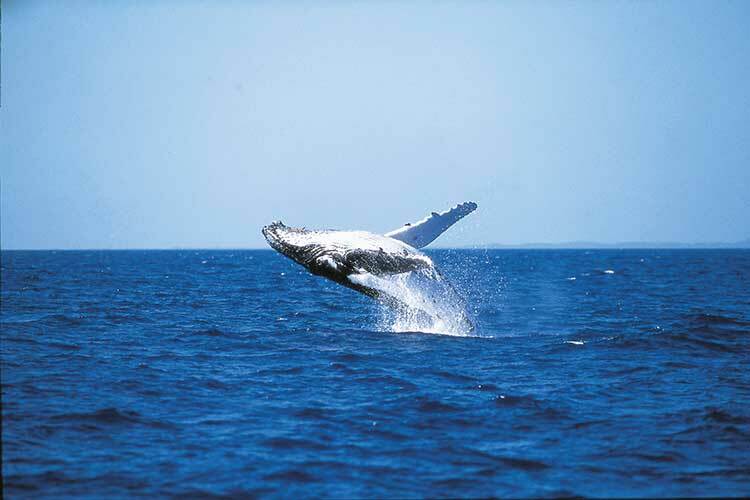 Humpback whales are marine mammals and like other mammals they are warm blooded and air breathing. They give birth to live young and their young suckle milk. At some stage of their life they have some hair on their bodies. Whales and dolphins are divided into two groups; those with teeth, the Odontocetes and those without, the Mysticetes. 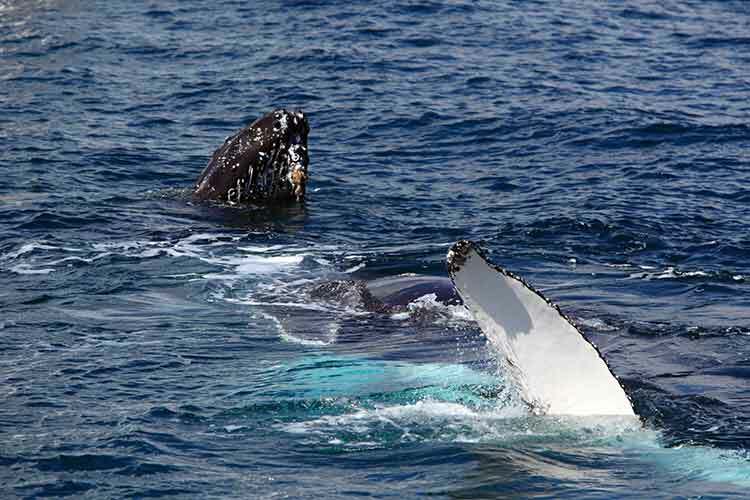 Humpback whales belong to the latter and have hundreds of thin plates called baleen. Large gulps of water and food are taken into the mouth cavity and the baleen acts like a sieve, trapping food and expelling water. Humpback whales are the fifth largest of all the dolphins and whales - with adults growing up to 15 metres and weighing up to 40 tonnes. A new born calf is around 4.5 metres long and 1.5 tonnes in weight. 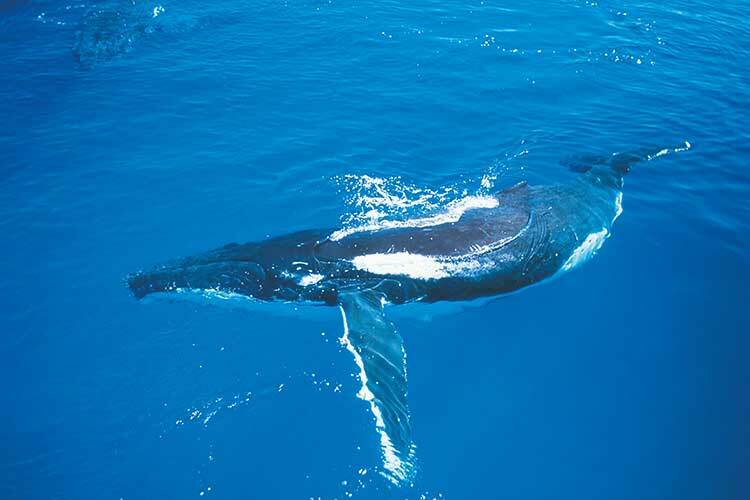 They are easy to identify as they have the longest pectoral fins of all whales, around 5 metres in length, and have large heads that are covered with knobs the size of golf balls called tubercles. 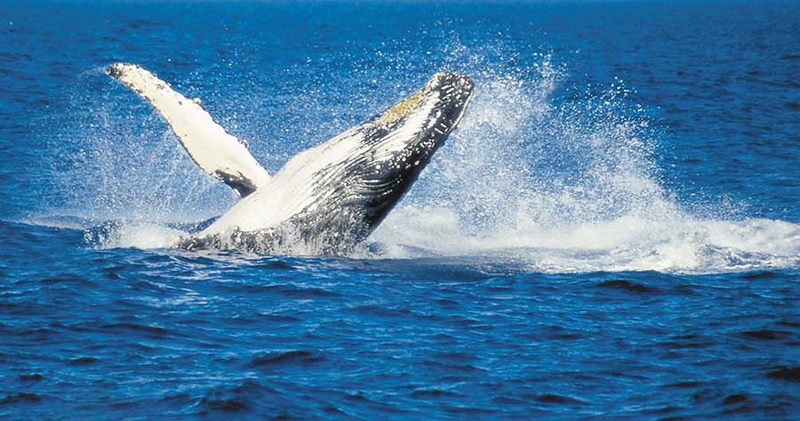 The lifecycle of the Southern Humpback whale brings them into Hervey Bay on Queensland's Fraser Coast. They leave the rich feeding grounds of Antarctica in May and make the annual 5000 kilometre journey to the breeding grounds in the warm waters of the Whitsundays, north of Fraser Island. Some of the females will give birth, while the others will mate. After spending a short period of time in the Whitsunday area the whales start the long journey south, many of them coming into Platypus Bay for as long as five days, some staying for only a day. When born, the humpback calves suckle their mother's milk which is 35 percent fat, compared to two percent in human milk. A suckling calf will increase its weight between five and eight times before nursing ends at about 11 months when it has grown to 8 metres in length. 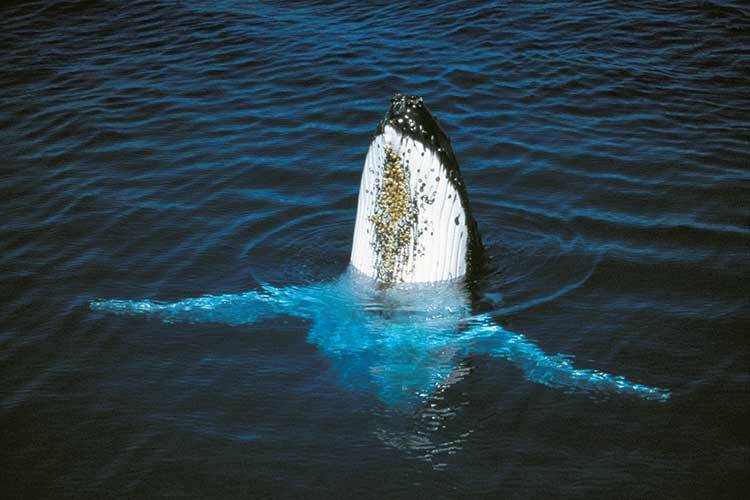 The humpback calf will suckle up to the rate of 400 to 500 litres a day. The calf needs to grow quickly and put on a good fat layer in preparation for the long swim south to the colder waters of Antarctica. 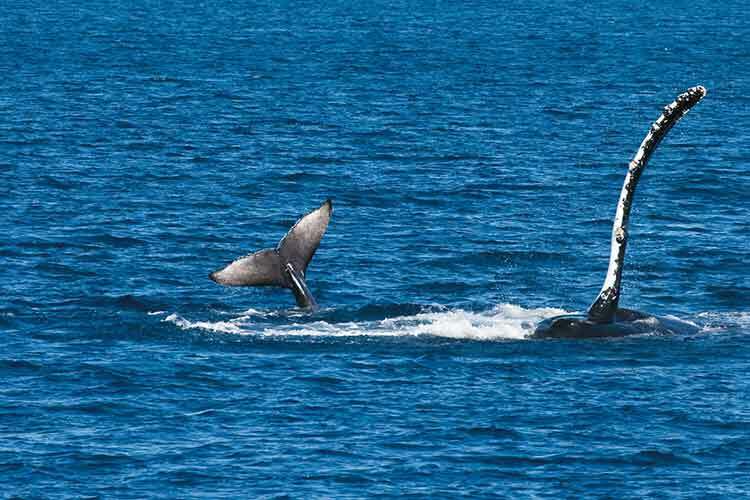 During the first part of the season you will see pods of mainly adult and sub-adult whales. Mothers and calves arrive towards the end of the season. Watching these magnificent creatures in their natural environment is very exciting. Imagine watching as an animal the size of eleven elephants propels most of its body out of the water and lands with a great splash on the surface, well you can see just that! You can also look a humpback in the eye as it raises its head from the water and spy hops near the boat. Whale watchers may also see tail or pectoral fin slapping or even be lucky enough to be on a boat that gets mugged by the whales when the whales come right in close to the boat and have a really good look, sometimes as close as 1 or 2 metres and staying around the boat for as long as 10 minutes or more. 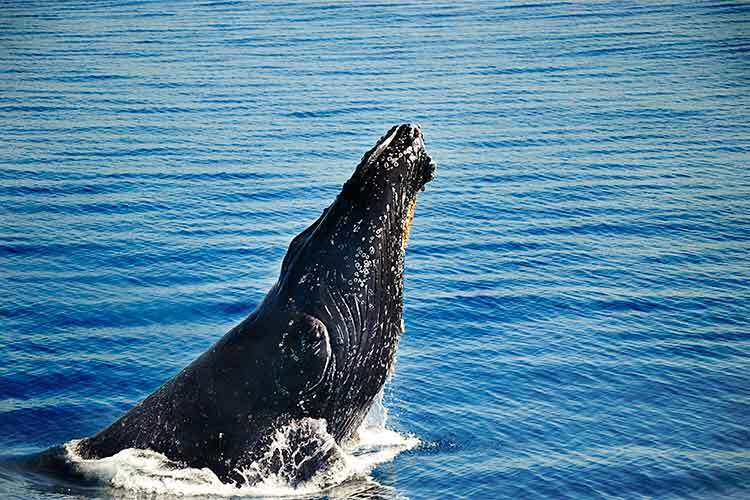 It is estimated between a third and a half of the 9,500-10,000 humpbacks that pass along the east coast of Australia will venture into the bay. Whale experts believe it is possible that the whales coming in to Platypus Bay on their migration may be forming a separate sub-population. In pre-whaling days the numbers were believed to be more than 10,000 (migrate up eastern coast) and probably closer to 30,000 in the whole of Antarctica. When the hunting of whales was banned in 1963 the number thought to be left was only about 200 individuals. Numbers are increasing at the rate of 8% to 11% per year. Various groups carry out research in the bay with the main objective being to monitor the recovery of the population. Humpback whales often show their tails before diving under the water and each tail has markings that make it unique. By taking photographs researchers can monitor the movements of individuals and over 1000 whales have been identified this way.